At Loughrea Dental we will always be open and transparent about our fees. All patients will be given a fee estimate prior to treatment. 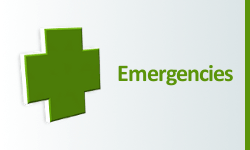 Private, P.R.S.I., and Medical Card patients are welcome at this practice. See the full list of treatments below to get a more detailed description. At Loughrea Dental we do a thorough 16 point dental health check where we examine the health of the whole mouth. We are not simply ‘just looking for holes to fill! At Loughrea Dental we do a thorough Dental Health Check for Children under the age of 14, which includes cleaning and any necessary low dose X-rays. 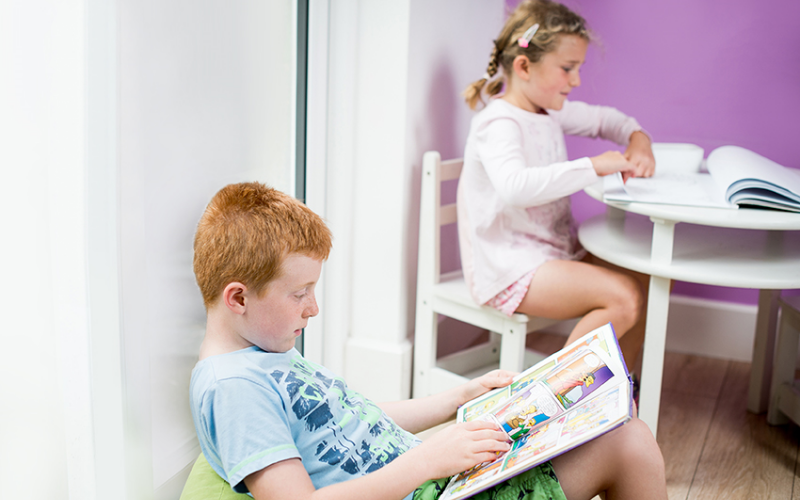 We also have a well stocked play area to keep children entertained, and help make the overall experience as pleasant as possible. The materials used depend on the position of the tooth and the size and depth of the cavity to be filled. Amalgam is still a popular choice for back teeth. Composite resin is tooth-coloured which is useful for front fillings and small back fillings. If you have a very large old metal filling the ultimate way of restoring it is to place a ceramic restoration. This will look natural, be very strong and is likely to prevent further breakdown of the remaining tooth walls. 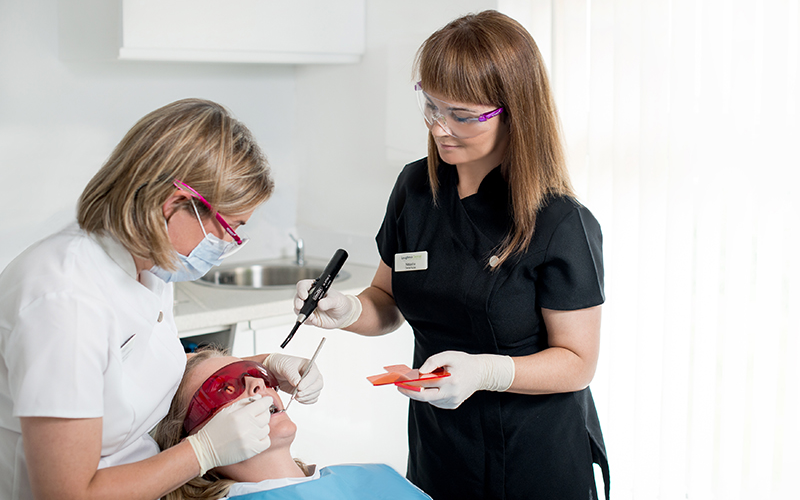 Our Dental Hygienists, will work with you to help keep your mouth healthy by removing any hard plaque that has been allowed to build up and they will share their skills, tips and techniques for helping you to control plaque every day at home. Fed up with Stained Teeth? Try our new signature High Gloss Diamond Scale and Polish. Using our new prophy airjet polishing technique, we can deliver the cosmetic results that will delight you. 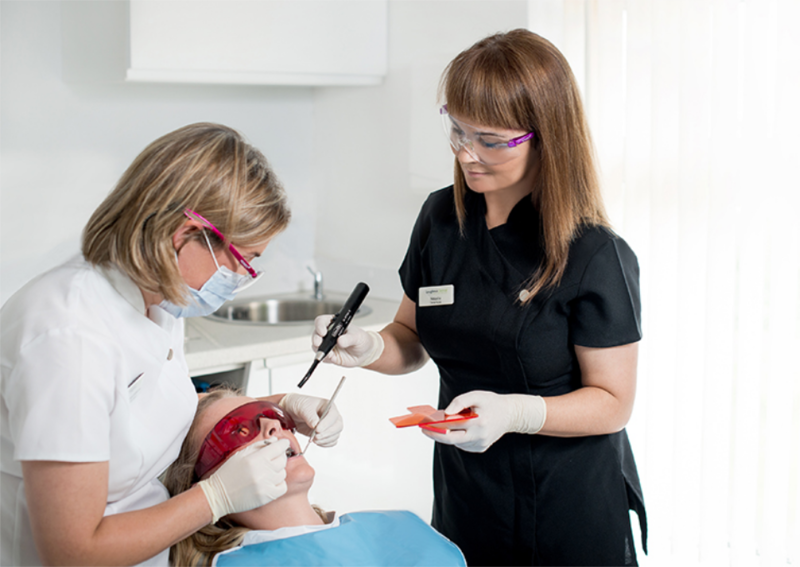 We will polish your teeth to a high gloss and restore their natural whiteness to give you a clean, bright, healthy smile in our award winning Dental Hygiene Department. Book your appointment now! Teeth may need to be removed or extracted for a number of reasons. The most common ones are when a tooth is badly decayed or broken down or when it is affected by severe gum disease. Teeth may also need to be removed to help create space to straighten and improve the patients smile e.g. in orthodontics. Crowns (also known as caps), inlays and onlays are dental restorations that are placed in or over a tooth, when that tooth has lost a significant portion of its structure either from extensive decay or trauma. Inlays and onlays are like partial crowns, and are now usually made out of porcelain. Crowns restore teeth to their natural shape, size & colour and enhance the overall health of your mouth. Crowns can also whiten, reshape, and realign existing teeth. Where back teeth have large broken-down fillings, a crown, inlay or onlay can protect & preserve the remaining natural tooth. Root Canal is a skilled and precise procedure which involves removing the infected pulp from the centre of the tooth and replacing it with a synthetic material. Root canal treatments save the tooth but afterwards it is likely to require a crown to strengthen it. Veneers are ultra-thin shells of ceramic (porcelain) or a composite resin material, which are bonded to the front of teeth. 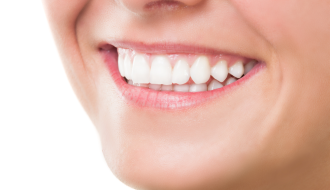 This procedure can be the ideal choice for improving the appearance of the front teeth. Veneers are placed to mask discolorations, to brighten teeth, close gaps and to improve a smile. 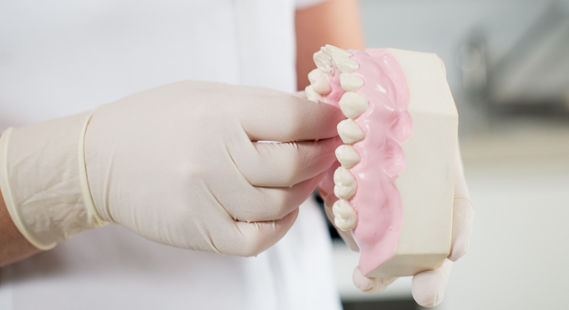 Dentures are a removable solution for missing teeth. There are two types of dentures: Cobalt chrome dentures are made of metal and have clasps for better retention, this type is suitable for a partial denture. The other type is made of acrylic and is used for full or partial dentures. A bridge is a custom-made artificial tooth that fills in the gap where a tooth or teeth are missing, and attaches to the two teeth on either side. The replacement tooth or teeth are either attached to crowns placed on either side of the missing teeth, attached to the adjacent teeth with wing – like appendages, or supported by dental implants. Bridges can be made of tooth-coloured material, metal or a combination of both. Fissure sealants are a safe and effective way of protecting the back teeth from tooth decay. They are plastic coatings which cover the chewing surfaces of the back adult teeth. The sealant forms a hard shield that prevents food and bacteria from getting into the tiny grooves in the teeth. These grooves are difficult to keep clean and are often the first place that decay begins. Most tooth decay in children occurs in the back teeth. 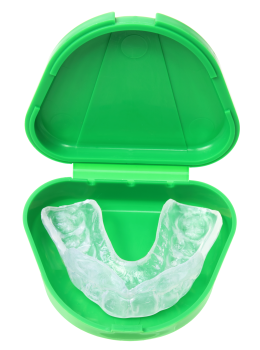 A mouthguard or a sportsguard is a specially made rubber-like cover, which fits exactly over the teeth and gums, cushioning them and protecting them from damage. It is important to wear a professionally made mouthguard whenever you play sport that involves physical contact or moving objects. These contact sports can cause broken and damaged teeth and jaws. A professionally made mouthguard will help protect against these events. A nightguard is an appliance much like a retainer that people put in their mouths to protect their teeth while they are sleeping. This device is commonly used by people who suffer from excessive night-time tooth grinding or clenching. This grinding and clenching puts pressure on the jaw, which can cause temporomandibular joint (TMJ) problems, severe headaches, ear pain, and neck pain as well as causing excessive wear to the teeth. 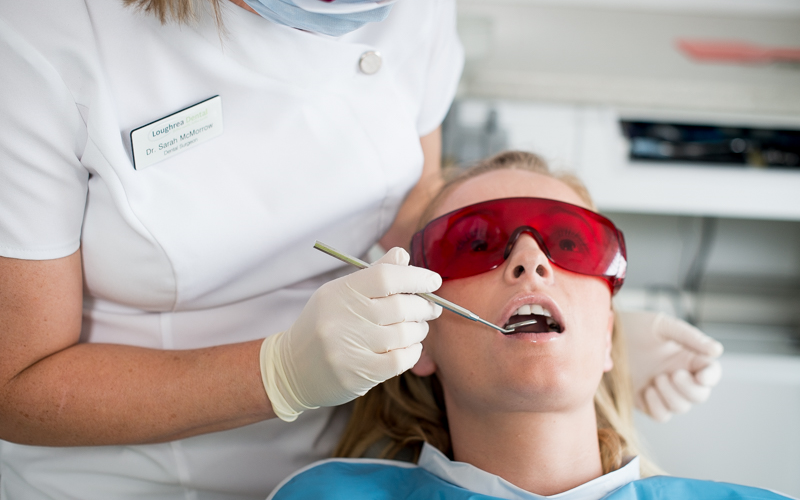 It is very important that your teeth are assessed and healthy before proceeding with tooth whitening. We use a home whitening system which involves making special soft clear plastic trays to fit comfortably and precisely over your teeth. These are then filled with a whitening gel and kept in the mouth for periods from one hour to overnight. At Loughrea Dental Practice we have invested in the very latest digital X-Ray equipment. 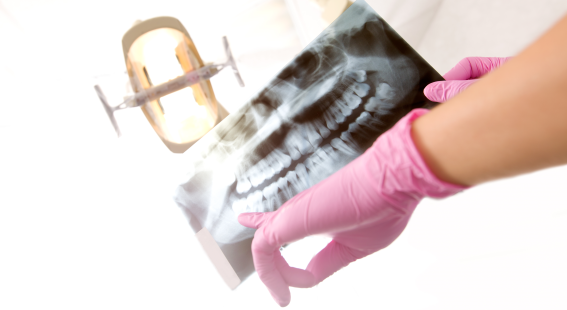 There are many advantages of using digital X-Rays over traditional X-Rays. Firstly, they are much safer as they use about 80 – 90% less radiation as compared to traditional X-Rays. Also with digital X-Rays, there are no harmful X-Ray developing fluids required to process any films which can cause damage to the environment. Unlike the days of conventional film processing, digital X-Rays allow us to view the image immediately and start treatment sooner, so you won’t have to wait for 15 minutes for the X-Rays to be developed. 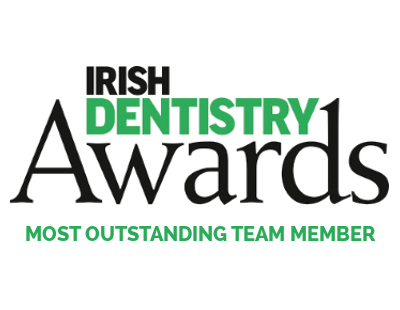 Contact us as soon as possible on 091 871512 to arrange an appointment. 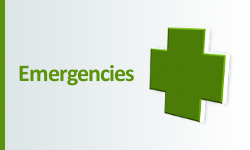 Early morning, lunchtime and evening appointments are available to suit your needs. Very bright and friendly atmosphere. My children were very relaxed and comfortable. Can be very busy but that just proves how popular the dentist is! Would highly recommend. Fabulous staff … The girls were all pretty nervous about going to the dentist but when I say we’re going to visit Sarah they get all excited … proof in itself !!!! Since visiting the practice for the first time in Dec 11 my lifelong fear of the dentist is long gone. 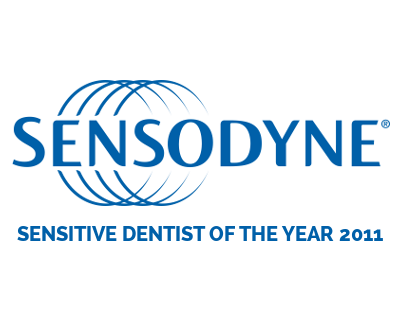 I have been here about six times this year and the treatment is always pain free and excellent. 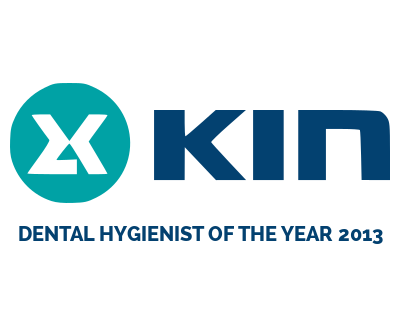 As someone who doesn’t visit the dentist often I found it very relaxing and staff and dentist very friendly and professional. Also very helpful as I need appointments on my day off and it was arranged to suit me. We hope you have found your visit to our website helpful. We hope to see you soon for your next dental treatment. If you require any further information please get in touch, we would be very happy to answer any questions you may have.